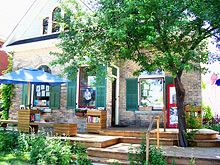 Book Stage is located across from the Studio Theatre in downtown Stratford, Ontario — home of the world famous Stratford Theatre Festival. We have thousands of books crowded (in an organized way!!) in a yellow brick Ontario Cottage, decorated with antique maps, art (mostly for sale) and cozy theatre props reading chairs. For a map and contact information, see the contact page.